Master Personal Trainer, NSAM, ACSM, Etc. Ryan is a NASM certified personal trainer with eight years of personal training and fitness instruction experience. 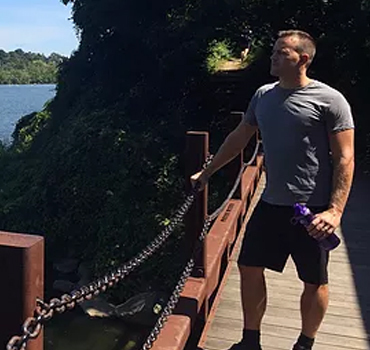 Like all FIT trainers, Ryan has a strong combination of academic credentials and practical experience and can design successful training programs for individuals working to achieve optimal fitness and specific goals. “My approach to fitness is to build the individual from the ground up. I accomplish this first by addressing and correcting muscle imbalances, strengthening the core and enhancing stabilization. Once a solid foundation has been established I progress individuals towards achieving their goals by way of a program that is individualized, organized, progressive. I next look to strengthen the body through the use of resistance strength training. My programs however will target many pillars of fitness not just one. I believe in an hybrid approach to developing a stronger individual. In my workouts you won’t just lift weights to increase strength. you will also be running and jumping rope to improve cardio. Learning and utilizing Foam rolling and mobility techniques to increase flexibility. Performing body weight circuits and using kettlebells to enhance power and performance.